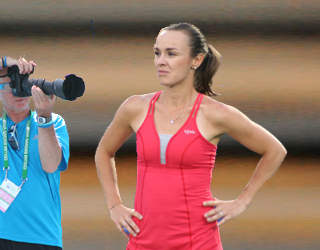 Five-time Grand Slam singles winner Martina Hingis stole the show this year, July 28 - August 5. The retired Swiss superstar came to the West Vancouver tourney at Hollyburn Country Club to promote a tennis fashion line she designed with Vancouver-based apparel company Tonic. Photo 1: Igor Sijsling of the Netherlands won the men's singles, beating Sergei Bubka of Ukraine in straight sets, 6-1, 7-5. Seeded No. 1 in the tournament, Igor jumped from 102 in the world to 74 after Sunday's final. Sergei eliminated three-time champion, Dudi Sela of Israel, earlier in the semis, 6-2, 7-5. Photo 2: Mallory Burdette won the women's singles event by beating fellow American Jessica Pegula, 6-3, 6-0. The win earned Mallory a wild card entrance into the upcoming U.S. Open's main draw. Photo 3: In the men's doubles final the Belgian Ruben Bemelmans, left, and Maxime Authom fended off John Peers and John-Parrick of Australia, 6-4, 6-2, to win the title. Photo 4: Julia Glushko of Israel, left, teamed with Olivia Rogowska of Australia to oust American Jacqueline Cako and Natalie Pluskota, 6-4, 5-7, for the women's doubles crown. Photo 5: Frank Dancevic of Niaara Falls, Ont., the fifth seed, fell to the top-seeded Igor Sijsling in a close match in the semis, 6-7, 6-3, 7-6. Frank and his girlfriend enjoyed their time in Vancouver this time arround - shopping in Robson Street and sight seeing. Photo 6: The 18-year-old North Vancouver Filip Peliwo, the winner of Wimbledon junior singles title, was granted a wild-card entry to the tournament. Filip played Taiwan's Jimmy Wang in the evening feature match of the opening round of Van Open. Filip lost 7-6, 6-0, but he showed in the first set that he can make the transition from juniors to the pros. Next up for Filip is the U.S. Open junior event. Photo 7: Martina Hingis, left, played an exhibition match with Toronto's Sharon Fichman. The 31-year-old beat Sharon, 6-3, 6-3, while ball-girls lined up to show off Hingis' tennis wares for players and tennis fans. Sharon lost in the second round to Monique Adamczak of Australia, 0-6, 6-2, 6-4. Photo 8: Thanks to Robert Exell, left, and Courtney for organizing the ball-crew for the tournament. Photo 9: Qualifying round: BC's Katerina Boiko, the winner of the Stanley Park Open, lost in the first round of qualifying. So did George Jecminek, the Chu brothers, Daniel and David, Alexis Prokopuik, and Stacey Fung. However, playing against these international players will definitely helped them with their games.